When it comes to historic preservation and the pleasures in restoring a vintage home, as a contractor here in Old Towne I realize that each home has its own unique challenges. We embrace difficulty, even in the most severe cases, such as . . . Built around 1905, the records tell us this building is one of only two remaining barns in all of Orange. 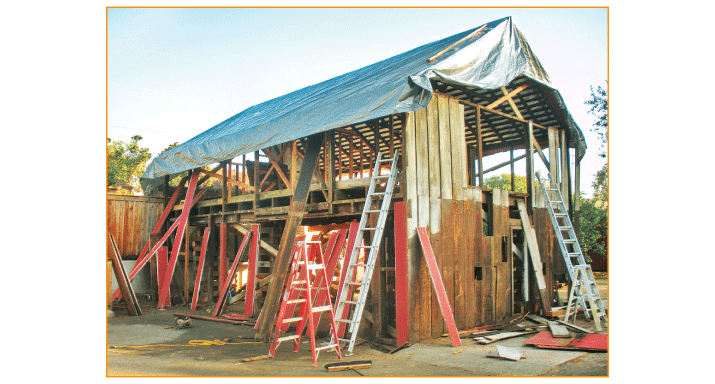 Understandably, there was an intense focus from the City of Orange and the OTPA to preserve the structure and to not have it dismantled or torn down. As you may know, when you own a historic home in Old Towne and hope to tailor it to your needs, the first step is to propose your plan to the City. Truly, there are only a few people here in Old Towne who fully understand what the City needs and how they base their responses according to code and guidelines set by the California Secretary of Standards. If you are about to take on a project that alters a historic structure, you will find it less aggravating and stressful by calling us at Cross Design & Construction or finding a local Old Towne architect who knows historic preservation. It takes comprehensive understanding of how these old structures were built and even more when it has to be lifted in the air and moved. The Glos barn was originally built with bat and board construction and leaned to the east considerably. This one took some thought… How do you lift and move a barn that is held together with rotten boards and rusty nails? The answer is YOU DON’T! First we had to do a certain amount of pre-construction in order to make it sturdy enough to move and then we were on our way. One of the most important aspects of the restoration requested by Chris was to use as much of the original lumber as possible on the barn—either by having the lumber remain exposed, or if it was removed, using it for architectural and design features that would complement the barn’s living areas. This was a wonderful phase of construction in which Chris and I enjoyed working together, bouncing design elements back and forth, bringing his vision into reality. In addition to enjoying each opportunity to preserve a historic structure, it is a true pleasure during the restoration process that Old Towne clients often become friends. Getting to know each other during the project enables me to ensure that the restorations are an ideal fit for my clients. Select to view Jul/Aug 2012 "Cross Design & Construction" article.